You have integrated your form with Dropbox. However, you want Dropbox files into unique custom folder names. The Unique ID Widget can be very useful when it comes to creating custom folders in Dropbox. 1. 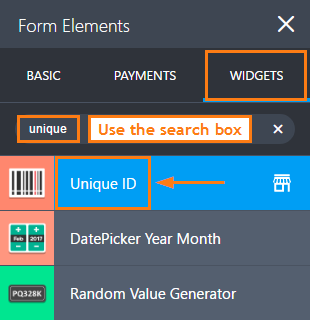 Add the Unique ID widget on your form. 2. 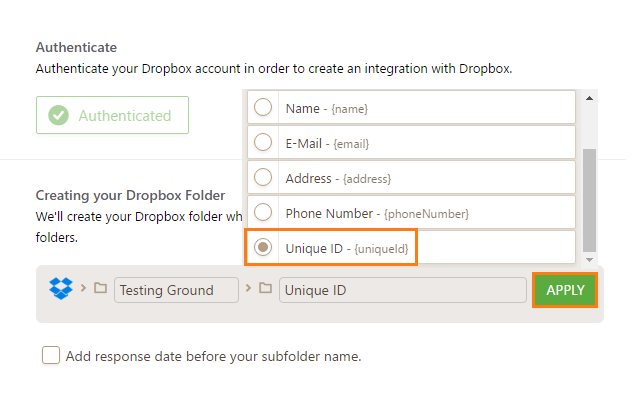 Then set this field as the sub-folder in your Dropbox Integration wizard. That's it - The submissions will then be shown in separate folders. Questions? Head over to our Support Forum or post it in the comments box below! Is it possible to automatically have a csv-file of the data of the filled form in the Dropbox-folder (together with the uploaded files and the pdf)? This feature looks interesting. Could the number be used to create a customer identifier that future orders can then be appended to, so long as the identifier is used?? Why does my dropbox integration look different? I'd like these options but can't see it this way. I'd much RATHER have EACH FILE appended w/ the name, w/ all files in the same subfolder of a main folder. Do I have to set up an account with Dropbox?